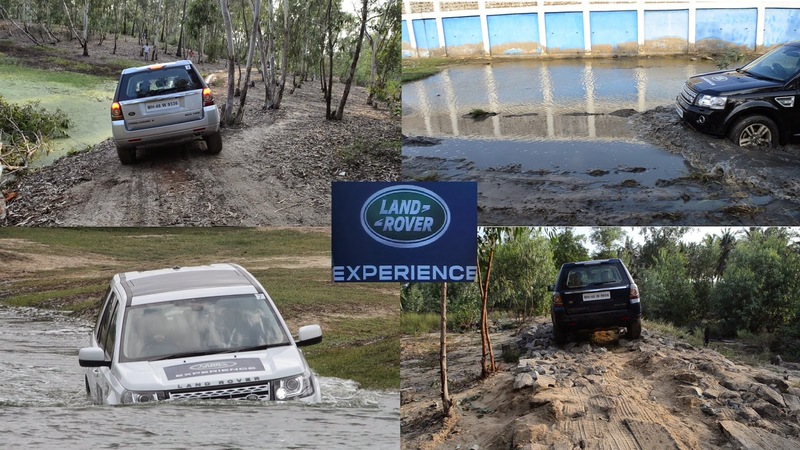 I was happy on receiving an invitation to be part of Landrover Experience- an off road event organized by JLR (Jaguar Land Rover) to help customers, prospects and the media understand the capabilities of Land Rover SUVs. Cut down my 2 day Blr visit to half and returned to Chennai in time for the event. During the event met up with other bloggers- Tinu Cherian from Blr, Ashwini CN from Chennai and Srinivas Ethiraju from Cudalore. The experience was planned at 'The Farm', a specialty restaurant on the outskirts of the city. Behind the restaurant they had a natural pond, some sandy area and open fields, all natural and perfect for off-roading. The experience was being facilitated by Cougar Motorsports, who specialize in wide range of OffRoad events in India, such as Tata Motors Full Throttle, The Himalayan Dash and many more. After lunch, we had a small briefing session, wherein we were told about the few features of the vehicle (Hill Descent Control, that can help prevent vehicle from slipping while climbing downhill), Terrain Response- which can change throttle response and a million other parameters based on the terrain (sand, rock etc) the vehicle is on. Clear instruction that we should follow our instructor’s command to the letter and if we don’t they may take over the controls. Indian racing driver Karun Chandok's father Vicky Chandok and brother Suhail were also with us during the experience. After being paired with an instructor, we went out to the lined up Freelanders. First thing I was told was the correct position to hold the steering- to ensure that fingers are never folded inside of the wheel (In case of a rapid recoil, this can injure fingers). I was given this golden Mantra of Off Roading "As slow as possible, just as fast as necessary". That is, in order to be successful in off road conditions, going slow is very critical- to ensure we stay in control, to ensure we don't damage the vehicle (and also so that freelander's computers get a moment to sense what is happening and adjust accordingly). However, there will be a few situation wherein too slow will get us stuck- such was mud tracks etc, uphill climb, wherein we need to maintain speed, just as much as necessary to clear the obstacle. Making this right judgement of required speed can single-handedly toggle the results between success and failure. I was not to use the camera during the drive, windows were not to be rolled down. So I just decided to (or rather had to) focus on driving experience and not recording anything. Amazon has not delivered by suction mount since 20 days, so I couldn't mount the goPro on the car. In my excitement I forgot about the head mount. We set out in motion. 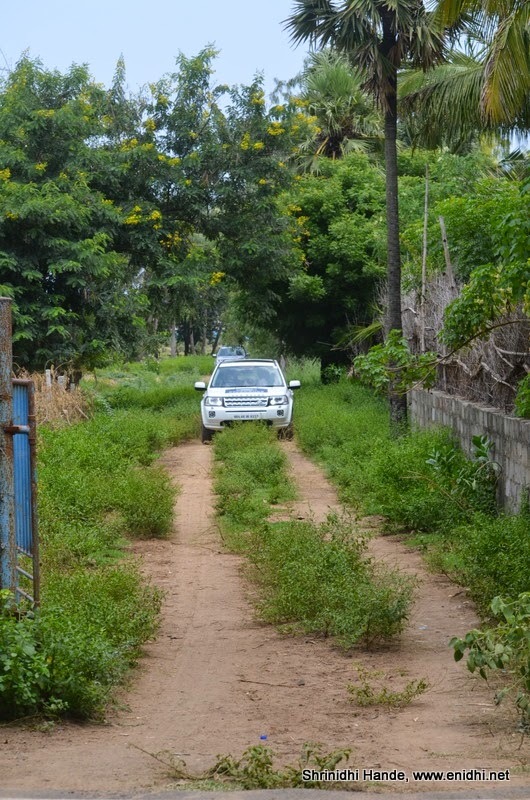 After negotiating small bushy terrain and sandy path between coconut trees, we entered the area with a few pits. We drove into the pit one by one, most of the time one of the wheels in Air. At times it felt as if the car would topple over, given the steep tilt we had. 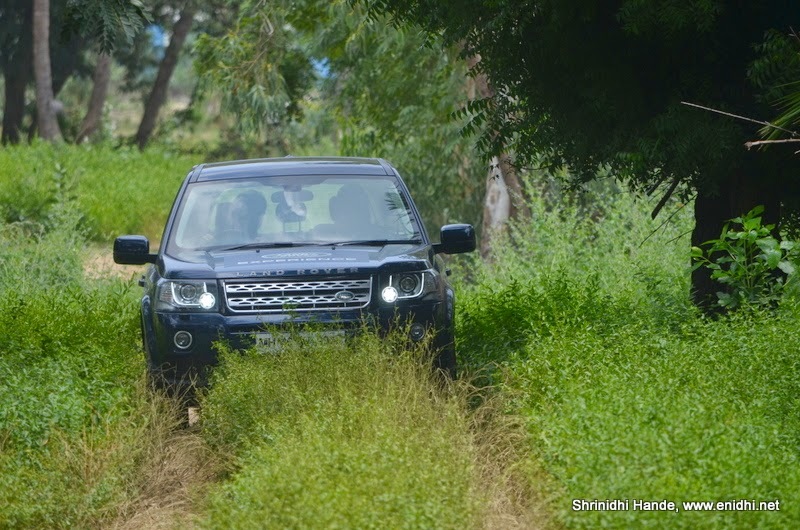 However, Freelander proved to be extremely stable, holding its ground during extreme maneuvers. Whenever a wheel lost traction, the other wheels take responsibility of pulling the car out. Super cool. Next came the water wading. Freelander has 500mm of water wading depth. (Tata Safari has 300mm, I had thought that is good enough, but now it qualifies as "Only 300mm"). There was a natural pond which I was told to be 4-5 feet deep. We took a peripheral path (always drove closer to the bank), but deep enough (almost up to the headlight level deep in water). 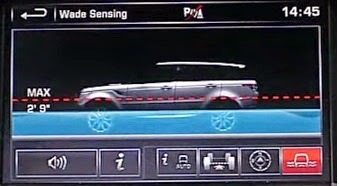 While Range Rover sports get a sonar display of water, I was hoping to see that in Freelander but it was not there. I was told to maintain a steady speed so that resistance from water is uniform. Though Freelander was 50% deep in water, not a single drop came inside the cabin. Later when we opened the door, we could see water flowing out through dedicated path in the frame, without affecting the interiors a bit. Enjoyed this swimming session. Wish I could do it one more time. Next was mud track, very light one at that, followed by a steep decline, wherein we had to negotiate a steep decline between a tree and a pond. Little to the left, we might end up in the pond, little to right, car with scratch against the tree. We let LandRover's hill descent control do its work, ensuring that breaks are applied in small instances and facilitating inch by inch movement to safety. Display has an indication that tells us which way the wheels are headed- this will help us in predict which way vehicle will move and take corrective action as needed. We negotiated few other similar paths, testing sand, incline, mud and uphill drive. Terrain Response can be changed on the fly. My instructor said I am driving a bit fast than required and it is not advisable. The final bit was a rocky terrain. A little up climb and we had to maintain the car steady and keep moving forward. Any error could have resulted in car drifting off the track. We drove back to the venue and got off the vehicle. 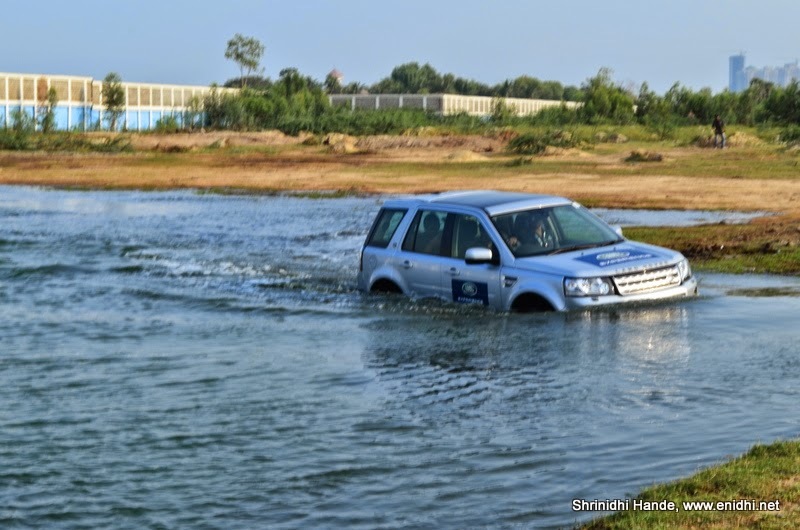 Felt good experiencing Landrover Freelander's abilities to handle some of the challenging obstacles, and having learnt a few tricks and tips from the off road experts. When life throws some touch challenges at you, it helps to have one of the best off road SUVs and best of technologies on your side. While we got off cherishing our memories, Freelanders were taken in for cleaning and to get ready for next lot. Overall the experience lasted for an hour. I went on foot during next batch to take some more photos. a very nice memorable experience overall. 2 2. 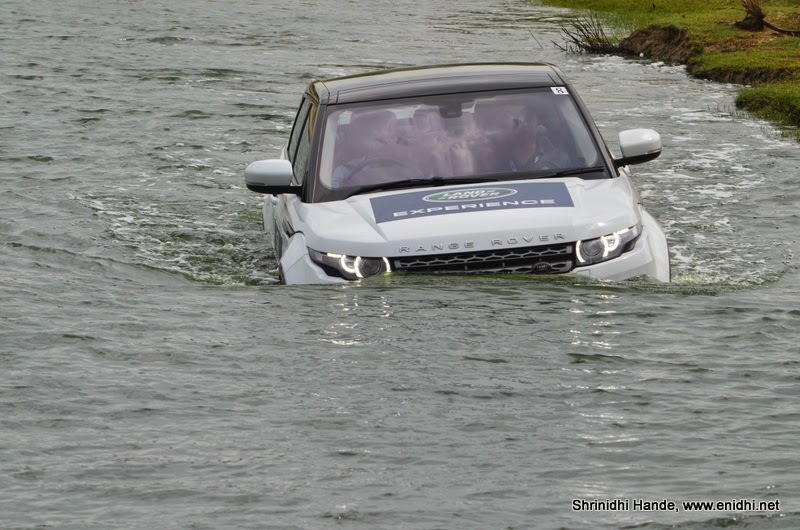 No Sonar: Rangerover gets a sonar display which can show live how deep the car is in water and how is the surface below. Freelander misses it. 1. Please note that we drove under the supervision of expert instructors (from Coguar motor sports) and drove exactly as per their guidance. This was to ensure safety to people and vehicle but meant no liberty to drive as per our calculations or drive around as per our wish and convenience. 2. 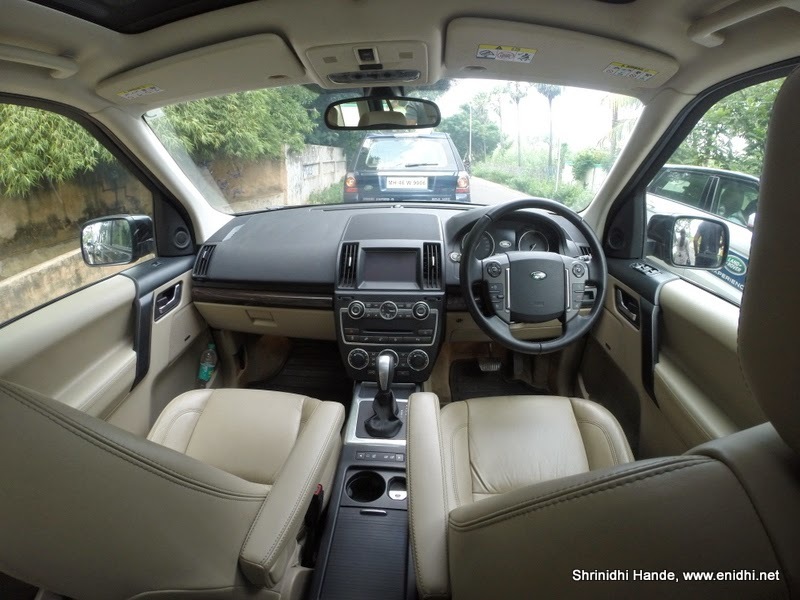 The obstacles we overcame, drove through were put in place after careful consideration of Freelander’s design limitations. In real world there could be more deeper rivers, more steeper climbs and more muddy patches. (Watch videos on youtube). No vehicle is invincible against mother nature. Advanced technology can never fully substitute human intelligence and judgment (or stupidity for that matter). So please use your discretion while attempting these off road attempts on your own. I've made some videos, which will be published after a few days once I am done with editing. Will include some more details and photos in that second post. Standby. 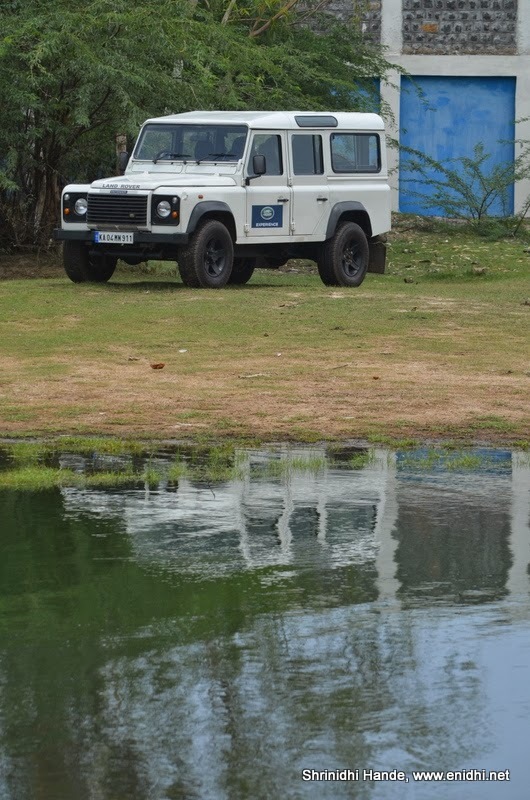 Do check JLR India official website for more details on the vehicle http://www.landrover.com/in/en/lr/. 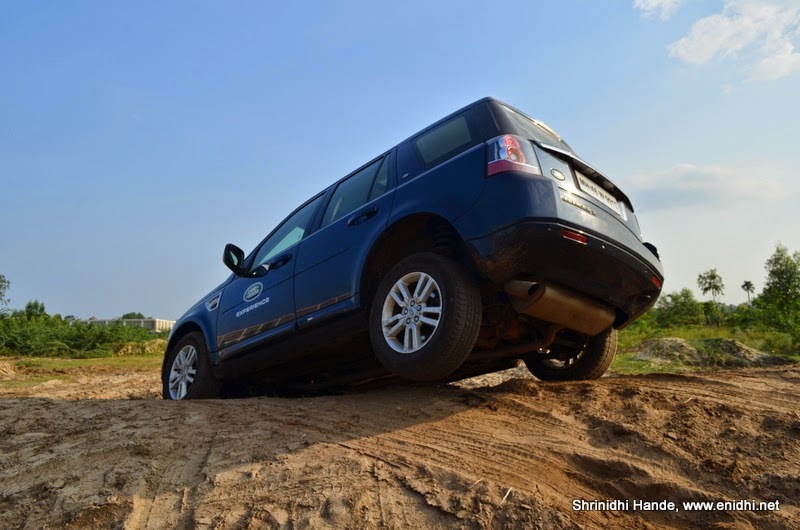 Thanks to JLR and BlogAdda for facilitating this experience. Thanks Sid. Yes, it is a great experience to have.